Last week's post about Harry's Brook turning milky white has a sequel. Returning to the scene of the milky mystery with my canine assistant, Leo, I came upon two young men in waders, peering with great concentration at the contents of two plastic trays. The water in the trays contained what signs of aquatic life Harry's Brook might hold. Tom McKeon works for Americorps and is based this summer at the Stony-Brook Millstone Watershed Assoc., where he has the title Watershed Ambassador. Peter Zampella works for the Pinelands Preservation Alliance, south of here. You can tell a lot about a stream by what sorts of aquatic life it holds. Some species are more sensitive to water pollution than others. Whereas a chemical test of the water will give a snapshot of the water quality that particular day, an inventory of the aquatic species able to survive there will reflect water quality over a longer period. Cumulative stress factors like low oxygen and periodic toxic spills will leave only the less sensitive species. If there were toxins in whatever turned the creek milky white the week before, the more sensitive aquatic species might die off, and not show up in the samples of water Tom and Peter were scrutinizing. As they do at the many other sites in the area that they monitor, they also measured water temperature, and did a rough calculation of water flow using a sophisticated device known as a rubber ducky. There are specially made floats for the purpose, but the rubber duckies work just as well or better. Only rubber duckies with the proper paraphernalia need apply for the job. Peter explained that the ducks with goggles, etc. are a bit heavier, giving them the optimum density for measuring the speed of water flow. Tom agreed to take my sample of last weeks milky water to the Watershed, where it could potentially get transferred to the state DEP offices for testing. We noticed that the white color comes from lots of white particles suspended in the water. The water quality verdict? Not great, though not surprising, considering that the water comes from a network of pipes that drain Princeton's downtown business district. This "green roof" has been growing, or at least persisting, on top of the Atlantic County Utilities Authority for a number of years now. Funny thing is that the portions of it that are green--those blotches of white clover on the right--are actually considered a weed in this context, and should be taken out. The brown areas consist of several kinds of sedums that despite their appearance are alive. You'd think that a legume like white clover, which fixes nitrogen from the air and thus makes the soil more fertile, would be a good thing. But in fact there is a reason to keep the soil poor. A more fertile soil will encourage more weedy growth, which in turn will shade out the sedums and leave nothing but weeds. If a drought comes along, and the weeds die out, the roof will have lost its vegetated cover. Low-fertility is actually beneficial in this situation, and likely has a lot to do with this roof being less weedy than others I've seen. Another reason to limit nutrients is that any runoff not absorbed by the roof will head into the local waterways through the storm drain system. Rick Dovey, our tour guide (the tour was organized by Sustainable New Jersey), told us that the green roof has markedly reduced heating and cooling costs for the building. Here are some sedums planted in what is essentially a miniature green roof, on the Mall near the Botanical Gardens in Washington, D.C. The plants are well adapted to this dry site. Butterflyweed (orange flower), threadleaf coreopsis (yellow), phlox (white), hosta and stonecrop (Sedum spectabile) are all well adapted to an upland location. If they grow well, weeds are shaded out. None of the species are aggressive spreaders, so minimal work is needed to maintain balance. The sidewalk protects it on two sides from invasion by weeds like ground ivy and mock strawberry, and runoff from the sidewalk can provide extra water. Some lasting affection for the plants, or at least knowledge of which plant is which, and affinity is usually behind gaining that knowledge. Yesterday, Harry's Brook turned into Princeton's own Milky Way. The source of the pollution is difficult to determine, because every part of the creek upstream of the intersection of Harrison Street and Hamilton Ave. was buried long ago in underground pipes. You can see in the distance where the creek emerges out of the oval pipe, with the intersection just beyond. In another era, kids would seek adventure and cooler temperatures in the summer by exploring these pipes, which extend up towards Palmer Square, where this branch of the creek begins. I took a sample of the water, and reported the spill to town engineers and the Stony Brook Watershed Association, which does periodic monitoring of the creek. These episodic spills, which may only linger an hour or two, don't show up in periodic water quality testing. There's been as yet no interest shown in testing the sample I took, which to the untrained nose had no telling odor. Hard to say whether it was serious pollution or of the "spilled milk" variety. Whatever it was, it will flow eastward down the length of Harry's Brook to where it empties into Carnegie Lake near Kingston. Some of Princeton's other underground creeks--those that drain the Witherspoon and Guyot Street neighborhoods, and flow west to join the Stony Brook near Johnson Park School, emerge from pipes in Pettoranello Gardens, and they, too, sometimes have an unusual color. One spill I tracked back to periodic releases by the town swimming pool when it flushed its filters. (There may be a different protocol now with the new pool.) The timing of this Harry's Brook spill is worth considering, with perhaps some end of school year maintenance going on. Anything poured into the street ends up in the local creek. And sometimes there are cross connections in which materials that should be going down the sanitary sewer to the wastewater treatment plant instead flow untreated through the stormwater system into the creek. Those who saw Stephen Sondheim's fairy tale-filled musical "Into the Woods" at McCarter may wonder if Jack's cow Milky White miraculously started producing again, but given McCarter's location in the Princeton landscape, that gusher of mythical milk would have headed straight down to Lake Carnegie, far from Harry's Brook's meanderings on the north side of Nassau Street. Still, fairy tales don't necessarily need to obey local topography. In any case, by today, Harry's Brook was back to its normal clear self, the only evidence of white being the bubbles from a small waterfall. Note: See update at this link. Interesting to watch how rose rosette disease is affecting local roses. Both in the wild, where its impact has been beneficial in setting back the highly invasive multiflora rose, and in intended rose plantings, like those blooming at the John Witherspoon Middle School, the impact has been inconsistent. Here, two bushes are so impacted that they haven't managed any blooms. They are framed by two shrubs that have resisted the disease thus far. What's good news for intended plantings (some specimens may survive or at least have a few more good years) could be bad news for land managers who thought the disease would do all the work of restoring balance and make our nature preserves far less prickly places. The resident ducks have been talking about the great weather lately. While the human contingent complains of clouds and gloom, the ducks have been thriving in the backyard wetland paradise born of cool, rainy days. The lawn is much more interesting when it's wet, as they probe with their broad beaks, perhaps filtering out choice bits of microflora and fauna. They've voted their approval of a third, newly dug minipond, located in the "headwaters" of the backyard stream to catch runoff from the neighbor's yard. The dense clay keeps it filled for days, without a liner. The mud at the edge of one of the older miniponds also appears to hold morsels of nutrition, unless they're just in to geophagy. Though there may be some sophisticated filtering going on, their twin interests in mud and water make for a messier coop. It's necessary to change out the water in the coop more often than with chickens alone, as the ducks somehow manage to transfer dirt into the water tray. At the same time, they spend considerable time keeping themselves clean. The beak that serves to explore mud also is used to toss water onto their backs as they bathe, at ease in their watery world bounded by Carex sedges and deertongue grass. Note: How the ducks will affect our mosquito suppression techniques awaits to be seen. In the past, some combination of Mosquito Dunks and goldfish, along with natural predators like water striders, have kept mosquitoes from populating the ponds. The ducks' presence may affect the ability of water striders and goldfish to do their work. There's a lot of vigilance that comes with the pleasure of having a new creature feature in the backyard. or the Mapleleaf Viburnums (V. acerifolium) common among the boulders along the Princeton Ridge, then their future absence will go unnoticed. So, is it better to maintain ignorance, or cultivate awareness so that these and other native Viburnums can at least be more consciously treasured during their remaining years in our woodlands? The Viburnums look perfectly healthy now, but there's a certain leaf beetle coming our way, specifically the Viburnum leaf beetle (Pyrrhalta viburni). First noticed in the U.S. in 1994, it's a species from Europe and Asia that skeletonizes the leaves, exhausting the shrub's energy reserves after several years of defoliation. According to an information sheet prepared by Cornell (http://www.hort.cornell.edu/vlb/), the Arrowwood Viburnums are the most vulnerable. Mapleleaf Viburnums will be slower to succumb, and the other common native, blackhaw Viburnum, may show greater resistance. According to a comment on a Cornell University blog post, the beetle had already shown up at Duke Farms in 2011, just 15 miles north of Princeton. This arrowwood Viburnum (lighter green foliage below is buttonbush and Virginia sweetspire) has reached ten feet high, along an ephemeral stream in the backyard. The mapleleaf Viburnums don't grow much past four feet in Princeton's woodlands. As with the flowering dogwoods that have become more rare along the east coast due to an anthracnose disease introduced in the 1970s, the impact may be most felt by migrating birds that depend on the berries to fuel their flight south in the fall. Knowing of the leaf beetle's imminent arrival at least gives us a chance to appreciate these shrubs while they can still spread a full array of leaves. It also deepens awareness of the importance of those who inspect plant material entering the country. My friend Steven honed in on a 2-3 foot plant in the more jungly section of his backyard that I'd never encountered before. He sent a photo, and asked whether to pull it out or not. I eventually came up with Cryptotaenia canadensis, a.k.a. honewort--not to be confused with hornwort, an aquatic plant. Honewort is a native that's in the carrot (Queen Anne's Lace) family. Its miniscule flowers cater to the needs of tiny pollinators, and its foliage feeds the black swallowtail butterfly, according to the description below, from the IllinoisWildflowers website. Sounds like a keeper. "Faunal Associations: The nectar of the flowers attracts primarily small bees, wasps, flies, and beetles. This includes the parasitoid Ichneumonid wasps and Wild Carrot wasps (Gasteruptiidae). The caterpillars of the butterfly Papilio polyxenes asterias (Black Swallowtail) feed on the foliage of Honewort and many other members of the Carrot family." A plant's behavior one year is not a sure indicator of how it will behave the next. This light green wave engulfing the plants around it seemed mild-mannered the first few years. Fringed loosestrife (Lysimachia ciliata)--a native not to be confused with purple loosestrife--has modest flowers facing downward, and grows beside streams or in other consistently moist areas. It's rarely seen around Princeton. So, why the sudden show of aggression? One cause may be the tendency of some wildflowers to seem well behaved the first few years, then start quickly expanding once they've established a strong root system. Here, the fringed loosestrife has completely enveloped blueflag iris and marsh marigold, with which it had been peacefully cohabiting. Turtlehead and sensitive fern, too, are getting run over. A bigger factor in this sudden expansion is likely the extra sunlight the loosestrife is getting since a big pin oak had to be taken down a year ago. Add extra hours of sunlight, and a plant admired last year for its quiet beauty has become this year a menace to the balance of the garden, and must be pulled out. A similar dynamic appears to be at work at Rogers Refuge, in an area where the shade of stunted ash trees curtails the cattails enough that they remain a scattered presence, allowing a more diverse understory of tussock sedges and ferns room to grow. Before venturing out today, you might want to read yesterday's (June 8) report on two bear sightings in Princeton, at PlanetPrinceton.com. Below is a link to the state website's information on important bear facts, and my notes from last year's DEP presentation, about the history of bears in NJ and why young bears are roaming into new territory this time of year. Here is what I learned, mixed with some info from the states informative website: Black bears used to range over all of what is now NJ, but were killed indiscriminately until 1953, when they were given some protection under New Jersey's game laws. The hunting season was closed in 1971. Over the past fifteen years, their population has spread from northwest New Jersey until they have now been sighted in every county in NJ. Despite the expansion, funding for bear management has faced deep cuts. Complaints about bears doubled from 2006 to 2008, but have remained fairly stable since then. Hunts were allowed in 2010 and 2011 during a five day stretch in December. In spring, the one and a half year olds head out to seek new territory. Bears are highly territorial, and the young bears much prefer to seek new territories than to risk what can be very violent and debilitating battles with already established bears. Princeton's recent visits by bears are of this nature. Lots of photos were shown of bear-proof trash cans, and bears climbing up to empty the contents of birdfeeders. Another showed a garage door bent out of shape by bears seeking food. Since any bear that experiences the satisfactions of garbage will seek more of the same, it's important that homeowners in northern Jersey and other areas where bears have become numerous act in concert to keep food out of reach. Some towns have passed ordinances to regulate trash storage. Sundrops (Oenothera fruticosa) is a native wildflower that likes sun. I've seen it growing wild in remnant prairies in the NC piedmont--the same piedmont that extends up to Princeton. Spiderwort (Tradescantia sp.) likes our wet, sunny ground in back. Rarely seen in the wild. Weigela is a common shrub, not native but not invasive. This is the newer variety, which some sites call Weigela floribunda. The older kind of Weigela (W. florida), has a lighter color and bigger size. Among native shrubs in bloom, here's the native Euonymus (americana), also called Hearts-a-bustin'. It's a favorite of deer, which means it has all but disappeared from Princeton's nature preserves. I saw one growing at Herrontown Woods a few years back, but have yet to find it again. The flowers are barely visible, but the berries are bright red and surprisingly ornate. This one's in our backyard, safe from the deer. The ubiquitous "winged" Euonymus in the woods is an exotic. So-called false indigo bush (Amorpha fruticosa) can be seen in Mountain Lakes Preserve and along Lake Carnegie. There's also one at Princeton high school ecolab that's flourishing in that habitat's sump pump splendor. 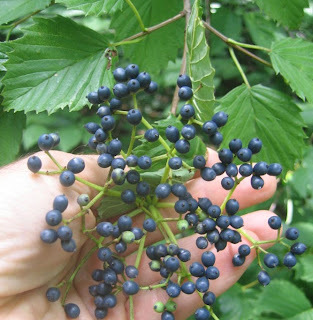 In the same locations, and also occasionally found elsewhere, is elderberry (Sambucus canadensis), a large, somewhat gangly native shrub that bears large disks of berries good for making pies, jelly and, for those with the skill and patience, wine. Some black bears have been spotted in the area, as reported in Planetprinceton.com. To make sure people are prepared for any eventuality, below is a reposting of my free interpretation of a presentation given last year by state wildlife officials about how to deal with black bears. At the presentation last month on black bears, given by state officials in township hall, I was astonished to learn that, in the very rare case that a black bear attacks, the best tactic is to fight back. Princetonians have not been called upon to display such courage since 1777, when we all could conveniently claim we had yet to be born. Black bears are near-sighted, so make noise to avoid surprising it. If the bear stands up on its hind legs, don’t worry. It’s just trying to see you better. Make sure the bear has an escape route. For instance, if it is following you out of the public library, hold the door open and give it plenty of room. If you encounter the bear in the woods, or on Nassau Street, you can back away slowly, but don't turn your back to the bear. In a calm, assertive voice, put the bear on notice that you are a Princetonian fully armed with opinions, and will not hesitate to express them. Avoid eye contact. If it doesn't run away right off, bang the pot you happen to be carrying with you, or download a "kitchenware noise" app on your iphone. Bears hate to cook, which explains their interest in garbage. Otherwise, clap your hands, raise your arms over your head, wave a jacket, all of which should make you look large and impressive. On rare occasions, the bear will do a bluff charge, at speeds up to 35 mph. If a cafe is close by, this is a good time to duck in for a double latte. If that option is not available, then you'll need to dig deep. Fleeing will only make you appear weak. Perhaps the stirring words of a high school football coach will come to mind. In any case, stand your ground, wave your arms and shout. Pretend you're in front of town council, venting your outrage over moving the Dinky. The bear should veer away from you at the last moment, providing a bigger thrill than any 3D movie at the mall. If the bear actually attacks, which is extremely rare, it's time to drop all remaining pretense of civility. Fight back. Don't worry about the bear's lack of access to dental care. Without asking permission, bop it on the nose. Bears' noses are 100 times more sensitive than ours. Use this sensitivity to your advantage, all the while reveling in what a great story this will make to tell the grandkids. In case you surf the internet for more info, don't be confused by accounts of how to behave when encountering a grizzly bear out west, where the protocol is completely different and not nearly so gallant. PrincetonNatureNotes goes multimedia with a wonderfully shot and edited HD video by Kurt Tazelaar and Sally Curtis. The April 7 walk in Gulick Park on the east side of Princeton was organized by Nicole Bergman. I'm the naturalist at large, Ed Simon leads volunteer efforts to maintain the park, and Bicycle and Pedestrian Committee member Steve Kruze also contributes. One "good old days" story Ed told is about a giant bull the Gulicks had that used to roam the woods and occasionally break through the barbed wire fence to explore the neighborhood. Below are a few stops along the way. A few weeks ago, as the local patches of bamboo were launching their spring offensive, consolidating their holdings of pricey Princeton real estate while expanding across fencelines into new territory, I encountered a Chinese man on the sidewalk, carrying a plastic bag of bamboo shoots. He looked like the real deal, as if he'd just stepped out of the labyrinth of a traditional Hutong neighborhood in China. Resident tourist that I am, I asked if I could take a photo, but he didn't speak English, and headed off towards the senior housing down the street. whose adventurous sprouts periodically block drivers' views, get trimmed, and end up in a heap in the street. With another neighbor's bamboo continuing to invade our yard, the edibility angle sounded worth pursuing. As an experiment, I collected some and undertook a dissection of one on the back patio. Despite bamboo's reputation as a very tough customer (their toughness comes from a combination of silica and lignin), only a few outer leaves needed to be stripped off of the terminal shoot to reach the soft underbelly of this most imperialistic of backyard plants. The next step would be to start eating, but there were questions. Are all species of bamboo edible? If only some, then is the local species one of them? Does it need to be cooked first? I was not looking forward to cracking a thick tome on grasses and analyzing microscopic features to figure out which of the 1450 species of bamboo I had just harvested. The botanist might become comatose before figuring out if the lemma is comose. "set back at least 100 feet from abutting property. It also requires people who sell or install running bamboo to educate customers on the plant’s growing habits and recommended containment methods. A fee of $100 is prescribed for violators of either requirement. The bill makes people who plant running bamboo liable for any damage the bamboo causes to neighboring properties, including the cost of removing any bamboo that spreads to neighboring properties. The measure passed the state Senate unanimously last week." What is running bamboo, one might ask. Turns out there are two main growth forms of bamboo, running and clumping. Clumping forms are better behaved. I found conflicting information about whether there are clumping species that grow well enough and high enough to provide the sort of screening people look for from bamboo. Here's one of many links. PRIABILITY: The Courant article mentioned Phyllostachys aureosulcata — yellow groove bamboo--which it called "the poster child for aggressive bamboo in Connecticut". Established stands of the species can travel 15 feet underground in a single year. When it reaches a house foundation, it can send shoots up underneath the siding, prying the siding off the house as it pushes upward. It wasn't hard to find a local example of this. Fortunately, these are slender shoots, but could still do some damage. as well as the characteristic yellow groove above the branches. EDIBILITY: The silver lining in this yellow grooved poster boy for aggressiveness was found in this description of the species: "Cultivated mainly as an ornamental, this species is also among the best for edible shoot production, being free of acrid flavor even when raw." So, thanks to a chance encounter with a Chinese neighbor, the world has become a more interesting, more edible place. There's still a question as to whether the tips of stems that have already grown several feet high can still be eaten. Though the Chinese man's harvest looked to be from stems already well above ground, this video suggests they have to be harvested just as they are emerging. The color of the flesh should be brown rather than the green said to make older shoots bitter. Given human nature and the ease of buying bamboo shoots at the store, there's no way that harvesting will solve the problem of bamboo aggression in suburbia. There are other, less edible invasives pouring across fencelines--Japanese honeysuckle, English ivy, ground ivy. Fortunately, none of these threaten to pry siding off of houses or push up through asphalt driveways. Bamboo's destructive capacities make it a pioneer in exploring the liability gardeners may bear for plants that escape from their yards. Regulation is often characterized as an intrusion by government into people's lives, but more often it offers a means of protecting us from intrusion. With all sorts of pollution--biological, chemical, sonic--"freedom to" impinges on a "freedom from". That's something to meditate on while nibbling on some tasty bamboo shoots. As evidenced by this bit of campus-grown tree planting, probably by some inspired students at Westminster Choir College, there's great satisfaction in planting a tree. Few small acts offer promise of so grand a result. If only we could unleash such forces for good through our fingertips, like superheroes, in all aspects of life. There was a time--back when Princeton and the rest of the eastern U.S. was mostly farm fields--when planting a tree had even greater meaning. The relative lack of trees made people feel like they needed to speed the process. Many of Princeton's pine plantations that lost so many trees in recent storms were planted in the 1960's or before, to jumpstart reforestation. It's nice to feel needed, particularly by something so grand as a tree. In many places we still are--along streets and in parking lots, where shade is needed to cool the asphalt, or to plant just the right tree in just the right place to shade a house or play equipment in a park. But one sign of a healthy habitat is the capacity of species to reproduce on their own. It turns out that, when given the right conditions--exposure to sun and soil and a lack of exposure to deer--they're really quite good at it. Backyards can be more likely to offer these conditions than many of New Jersey's forests. and thousands, on pavement, lawn and in flower beds. These happen to be the achenes of maples that twirled down like helicopter blades from nearby trees to seed every square foot of house, yard and driveway. They'd even grow on the roof if given a chance. Meanwhile, last year's seeds have shown smashing success in converting themselves into seedlings, which I pull out by the hundreds if the soil is soft enough, as they pop up anywhere a square inch of soil can be found. and the most prolific of all, scores of silver maples. With sunny areas in the yard being saved for wildflowers, tomatoes, and dreams of a few solar panels, none of these trees get to grow. But they show what trees can do, on their own, when conditions are right.